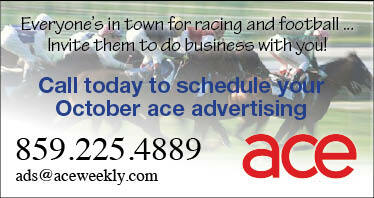 This story appears on page 4 of the October 13 print edition of Ace. Technology, innovation, learning and play take the stage in Lexington in October in two events: TEDxLex at the Kentucky Theatre, and Tech Week at the University of Kentucky. According to organizer Kent Lewis, the TEDx event provides a platform for local creative minds to learn from extraordinary speakers, and spread their ideas on how new media and technology are shaping the future of Lexington as well as the world. “We’ve got a lot of dynamic speakers. We’ve got a couple of gamers. One reason for that is that Lexington is No. 2 in the country for cities per capita with one or more game systems in their house. That’s about 35 percent of the population,” Lewis said. “Basically the reason behind it is that I don’t believe that you have to develop the next DNA strand that’s going to solve a world problem or that you need to develop the next technology device that’s going to change the world. At first, the iPod was just a playful device. You can do a lot of neat things that are playful….it doesn’t have to be technology. It can be playful art form, a playful entertainment,” he said, in an interview last week. Bianca Spriggs, Affrilachian Poet; Ash Donaldson, Aussie Behavior Geek; Alicia L. Bertone, DVM, Ph.D., Diplomate ACVS; Joe Castillo, Sand Artist; Billy Valentine, Sonic Cartographer; David J. Feola, Pharm.D.,Ph.D. ; Charlotte Fixler, Think Fun; Pheeva (John Meister, Lamar Wilson and Lafe Taylor); Warren P. Rogers, W Rogers Co.; Eric Thomas, Owner of Automatic Rain; John K. Bates, Blue Suited Ambassador of the Virtual World; Michelle Hollis & the Moves Crew; Jaysyn Wyche aka JK47, Turntable and Fly Deejay; Michael Hartman, owner of Frogdice; Dorothy Edwards, Ph.D., livethegreendot.com. Lewis’ recommendation for people who are attending TEDxLex? Bring an open mind and sense of wonder. Mayor Jim Gray donated two days of use of the Kentucky Theatre to the event to keep it downtown, Lewis said. Lewis is a Lexington native, who attended Paul Laurence Dunbar High School, UK, and Morehead State University. After attending the first TEDx planning meetup at TED, he became the local licensee and curator of TEDxLex, and Lexington became one of the first cities to host a TEDx. The event is also making inroads with area youth. A group of about 24 elementary students in the gifted program in from Versailles will be attending with their teacher Brad Clark, Lewis said. Info at TedXLex dot com. The cost is $55, which includes breakfast, lunch and giveaways. Students with a valid ID can attend for $25. Tech Week is in its second year, sponsored by the University of Kentucky’s College of Communications and Information Studies, Keeneland, and the Information Communication Technology Collaborative at UK. On Wednesday, Oct. 19, from 9 a.m. to 3 p.m., local and national speakers will participate in the Academic Web Presence forum. Attendees to the free public event at the Niles Gallery in the Lucille Little Fine Arts Library on the UK campus will hear from people who plan, develop and populate Drupal-based websites for the academic, business, media and organizations. One session will address the development of University of Kentucky’s dynamic multimedia “UKNow” information hub Web site, run on Drupal by University of Kentucky Public Relations. Other speakers will discuss the evolution of UK’s award-winning main website and the newly redesigned College of Arts and Sciences website. Keynote speaker Jean V. Chick, Partner-in-Charge of Real Estate Services with Deloitte LLP, will discuss parallels between technology and learning at UK and at the new $300 million Deloitte University site that the Big Four accounting firm has built on 30 acres it purchased from Ross Perot outside Dallas. Chick, an accounting graduate of the UK College of Business and Economics, coordinated bringing Deloitte University online. Its 800-room campus will be the main international training site for Deloitte, which posted operating revenue of $28.2 billion in it most recent report. The technology at Deloitte University emphasizes technology-assisted, collaborative and simulation-based learning. Dr. Konstantin Tovstiadi, the College of CIS IT Director and the coordinator of a lively Drupal support and training community on the UK campus, is one of the main organizers. “I think that it grew out of wanting to do something around the topic of consulting and consulting in the sense of experts helping someone else within the academy and outside of the academy,” said Tovstiadi, who has planned, developed, and built two large-scale Drupal-based sites for the college. Tovstiadi talked about Drupal as a platform that is growing in popularity, especially for educational and governmental Web sites. “It starts to shine at the college or university level or enterprise level. It is very easy to customize and is modular. If you look locally, Lexington Public Library has recently launched a site, Keeneland is considering it, and UKNow is operated on Drupal,” he said. “Our ‘friends,’ at the University of Tennessee, Knoxville have used it for years and years very successfully,” he joked. Additionally, sites such as the White House, the Department of Energy, and the site for The Economist are on Drupal, Tovstiadi said. Kakie Urch is an Asst. Professor, Multimedia at the University of Kentucky’s School of Journalism and Telecommunications College of Communications and Information Studies.